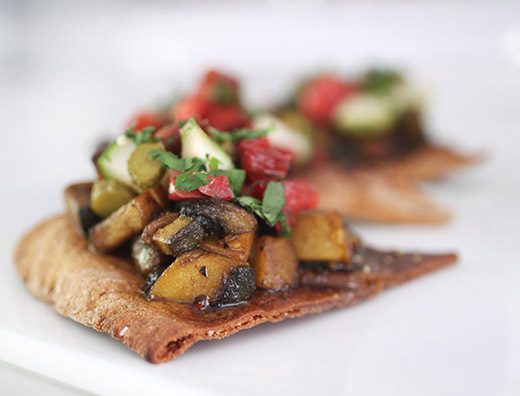 I’m always drawn to the flavors of Levantine cooking and the generous use of vegetables in varied dishes. A new book starts with those flavors and adds new ingredients to open up the possibilities of this style of cuisine. The book is Levant: New Middle Eastern Cooking from Tanoreen by Rawia Bishara, and I received a review copy. Her first book, Olives, Lemons, and Za’atar, stuck more closely to traditional recipes, but this time, she explores some new directions as she does at her New York restaurant Tanoreen. What I enjoyed about this book is that it gives you freedom to roam about a bit with traditional dishes. Rather than sticking to how a dish has always been made, new discoveries are celebrated and encouraged. The recipes are still inspired by Middle Eastern cooking but with a new perspective. For instance, the Shakshuka is a green version made with tomatillos, poblanos, and summer squash. Although hummus literally translates to chickpeas, here the concept is expanded into four variations, none of which include chickpeas. And, I can’t wait to try the Avocado Hummus. The Fall Fattoush is a twist on the familiar pita bread salad made with red cabbage, radicchio, and shredded beet. There’s a vegetarian Kibbie made with potatoes and spices that’s served on a lentil stew that looks perfect for a cold, fall day. There are meat dishes too like Harissa Baked Chicken, Tanoreen Spiced Cornish Hens, and Grilled Fish Kabobs. But, I got sidetracked among all the vegetable options and had to try the Portobello Shawarma and Quinoa Tabouleh first. This vegan shawarma starts with chopped Portobello mushrooms and lots of spices. 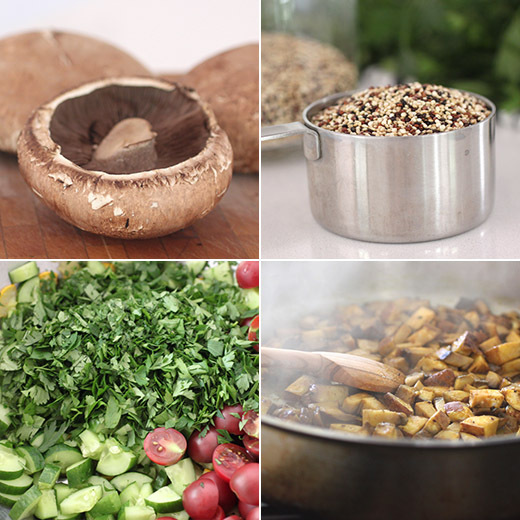 The chopped mushrooms were combined with black pepper, ground coriander, cumin, turmeric, cardamom, nutmeg, chopped fresh garlic, olive oil, and white vinegar. The mixture was cooked in a heated skillet until the mushrooms were tender. I was surprised at the amount of vinegar but found that it gave the mixture just the right added flavor. The cooked mixture was intended to be served on fresh pita with sandwich toppings like cucumber, tomatoes, pickles, and tahini sauce. I went in more of an appetizer direction and served the mixture on homemade, baked pita chips, and topped it with chopped tomatoes, cucumbers, and herbs. 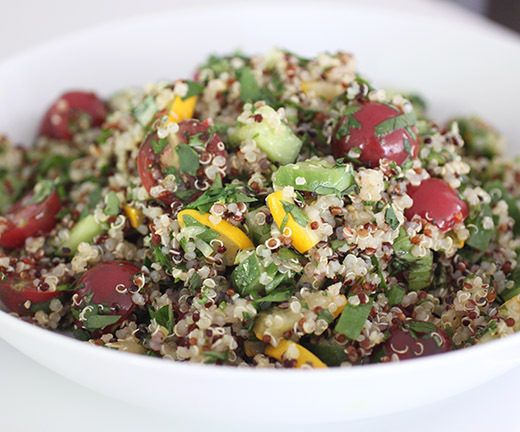 The Quinoa Tabouleh is a lot like the traditional dish only with quinoa used in place of bulgur wheat. Diced fennel is suggested along with tomatoes and cucumbers, but since that’s not in season here I used chopped yellow zucchini instead. Lots parsley, cilantro, mint, green onions, and lemon gave it the expected flavors of tabouleh. I always like vegetarian dishes like this Portobello Shawarma, but these mushrooms actually caught me by surprise. The spices, garlic, and vinegar gave the mushrooms incredible flavor. They would have made a fantastic sandwich filling and were a fun topping for pita chips. The tabouleh was as fresh and bright as ever but just a little different with quinoa instead of bulgur wheat. It’s inspiring to see new takes like these on traditional dishes, and the results are delicious. If I were lucky enough to be visiting Melbourne, Tivoli Road Bakery is exactly the kind of place I’d want to find while out for a stroll. Michael and Pippa James’ bakery was built on their relationships with farmers and suppliers while finding the best ingredients, and it was built on excellent baking, of course. The book The Tivoli Road Baker: Recipes and Notes from a Chef Who Chose Baking , of which I received a review copy, tells the whole story. Descriptions of ingredients and suppliers are interspersed throughout the pages of recipes making clear the bakery’s goal of using the best in terms of flavor, sustainability, and cultural identity. One story highlights work being done to learn how early indigenous Australians harvested grain and made bread, and another explains the methods of a biodynamic farm. I was sold on the philosophy and then became a bigger fan as I read about the types of sourdough bread they bake. There are complete instructions for creating and maintaining a sourdough starter and step-by-step guides for each stage of dough mixing, shaping, and baking. 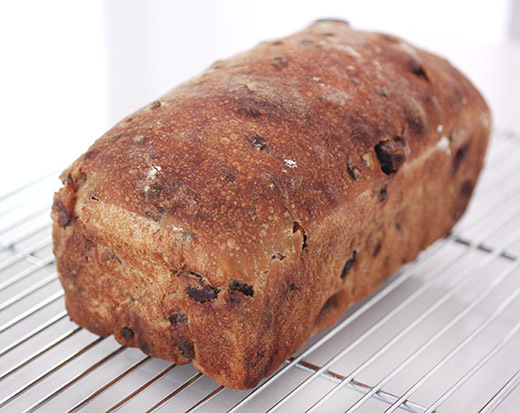 I was intrigued by the Olive Loaf made not just with a mix of green and black olives marinated with herbs but also with tapenade incorporated into the dough. The Wholegrain Rye and Buttermilk Loaf looks delicious on its own and as the base of an open-faced, cured salmon sandwich. In fact, there’s a chapter of Sandwiches for inspiration for all the breads and Salads to go with them. There are also chapters for Viennoiserie, Pastry, Seasonal treats, and British Bakes. After mastering the Croissant Pastry, there are several recipes for using it like the incredible Morning Buns with vanilla custard. Some other recipes that I’d love to try include the jam-filled Lamington Doughnuts, the gluten-free mini Pear Almond and Brown Butter Bundt Cakes, and the loaf-pan baked Pistachio Cake. While reading the book, I pulled my sourdough starter from the refrigerator to feed it and get it ready to go to work. I had to try the Fruit Sourdough first. 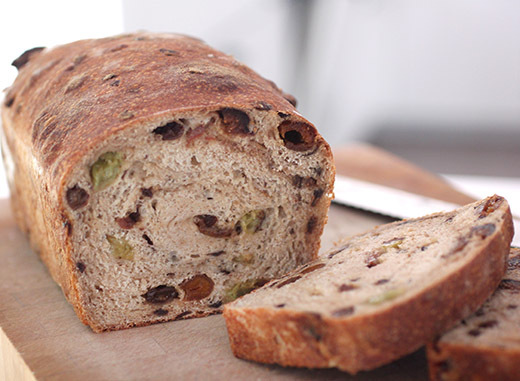 It’s a bread loaf with almost as much jewel-toned dried fruits as bread in each slice. As always with sourdough, I had to get my starter back into shape first. I store it in the refrigerator and let it go dormant between baking projects. I feed it in incrementally bigger portions for three feedings one day before I intend to use it. 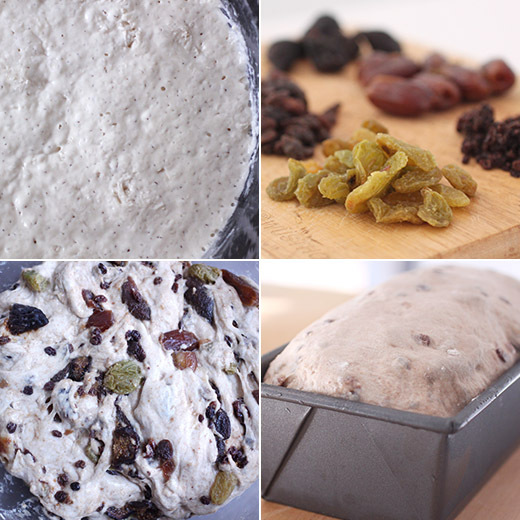 For this bread, the dried fruit needed to be soaked overnight before beginning. Also, all of the sourdough breads in this book begin with a starter build that’s mixed four to six hours before being added to the dough. For the fruit, golden raisins, currants, black raisins, pitted and halved dates, stemmed and quartered figs, and some ground ginger were measured and placed in a bowl. In a saucepan, a cinnamon stick, a star anise, and some water were combined. Red wine was to be added, but I used white wine instead since that seemed less wintry. The mixture was brought to a boil and then left to steep off the heat for 10 minutes. After steeping, the mixture was strained over the dried fruit, and it was left to soak overnight. The starter build was made with sourdough starter, bread flour, whole wheat flour, and water. The dough was started with bread flour, whole wheat flour, rye flour, and water and was left for the autolyse for about 30 minutes. Then, the starter build and salt were added, and the dough was mixed and left in a large bowl before the folds began. Before the first turn and fold in the bowl, the soaked fruit along with some chopped dried apricots were added. The fruit-filled dough was then turned and folded every 30 to 45 minutes a total of four times. Next, the dough was pre-shaped and left to rest for 20 minutes, and then it was shaped for the loaf pan. There are complete instructions for all of these steps in the book. I left the dough in the loaf pan in the refrigerator overnight before baking. And to bake, my preferred method for steam in the oven is to place some ice cubes in a cast iron skillet that sits on the oven floor for the first 15 minutes or so of the baking time. The loaf baked until golden and crusty on top. This was a somewhat wet and sticky dough that resulted in a tender crumb around all of that fruit. As noted in the book, all this bread needs for serving is a little butter. It was fruity and sweet with no added sugar, and it went perfectly with some afternoon tea. Melbourne is lucky to have this bakery that’s building strong ties in their food community, and I’m lucky to have their recipes.